Our rooms are fully equipped and furnished for your confort. The rooms have been recently redesigned and combine the warmth of hacienda style building and the edgy style from modern details. But i think pictures speak lauder than words! - The whole hostal and rooms have high speed wireless internet conection. - A common living room with a fireplace. - There is a BBQ on an open area. - A small hiking route up the mountain. 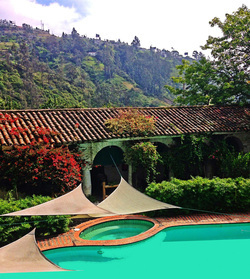 - A small distance from both Quito and Cumbaya. - An outside dinning area.